I first went to Copper Chimney on Airport Road when I was relatively new to Bangalore. Not sure if that place still exists, but I do remember totally enjoying the experience. I knew that Bangalore Central had a Copper Chimney and so when Sudhakar suggested we go there, I was quite enthused. It being a Sunday and we being there at prime Sunday lunch time of 1.30pm, getting parking space was a absolute female of the canine species. Thankfully we got seated at the restaurant immediately. The place is nice and airy with french windows opening out to a vast balcony. But if you look closer you will find peeling paint and the false ceiling coming off in bits and pieces. This totally belied the image I had of the old Copper Chimney. Looks like the once high-end restaurant has been beaten down to a mid-sized eatery. Both of us were in a mood for beers and KF premium pints is what we had. Along with the beers came a plate of raw onion rings and what was supposed to be mint and yoghurt chutney. While it did look the dish, it tasted very bland. I was surprised at the combination and then Sudhakar enlightened my dull mind that it was in anticipation of the starters we had order. I guess this one is obvious! 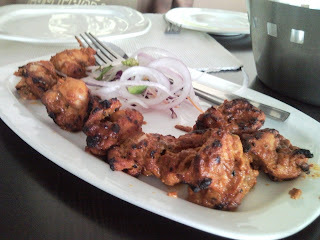 The starter was Achari Chicken tikka - grilled chicken marinated in pickling spices and mustard extract. The dish was nice, but honestly pickling spices are supposed to have a tangy taste - this was absent. Mustard extract should bring about a distinct spicy twang and that was not present either. But overall, the dish tasted great. 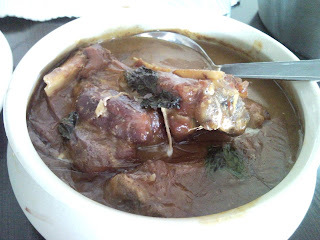 For main course we had the Kareli Ki Nihari - baby lamb shanks dum cooked in rich stock overnight flavoured with cardomom and saffron. One word - delicious. The gravy was thick and flavourful and meat was literally falling off the bone. The dish is heavy considering its been cooked in stock overnight. 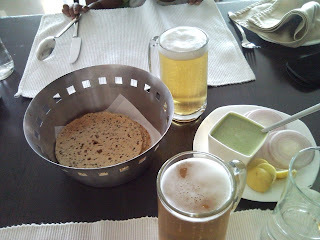 To accompany this we decided to try two rotis we haven't had before. 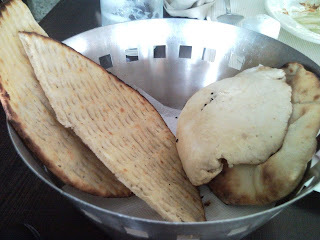 Khasta Roti which is ajwain flavoured wheatbread baked in a tandoor - more on the crisp side. Nice.. but don't order this one if you prefer your rotis soft. I had the Taftan which was enriched with milk and yoghurt. This were soft mounds of bread with the distincty taste of yoghurt. Absolutely scrumptious with the nihari. Dessert was Malai Phirni in a matka. 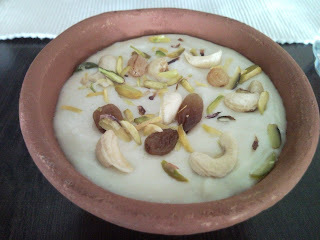 It was loaded with malai and dry fruits. Good thing we ordered just one. The phirni was absolutely smooth as against the grainy rice texture of regular phirnis. But it was sweetened just the right amount and was a great end to a satisfying meal. Service is a little on the fits and starts side. This meal came with Rs 900 drinks included. Oh yes, the loos are good. A nice place for a leisurely Sunday lunch.